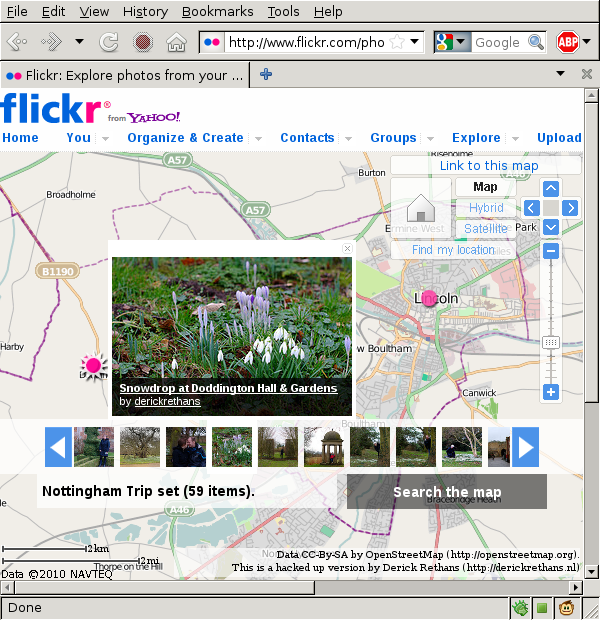 Derick Rethans has a new post today with a bit of code showing how to combine Flickr and OpenStreetMap and make a mapping tool that plots out the location information for the Flickr images. I like taking pictures, and I usually take a GPS so that I can place them on a map on my Flickr page. On my last excursion however, the battery of my GPS had died, so I did not have location information available to store in my pictures' EXIF headers. Flickr can use the EXIF headers to then show the images on the map. Because I did not have the location information to automatically place my pictures on the map, I wanted to do that by hand. His script (as used by a local Squid proxy) supports two different versions of the mapping - one for Yahoo! Maps and the other for OpenStreetMaps'. You can see the end result here - a set of Flickr images with a map in the background. In this new post to the iFadey blog, there's a quick tutorial on using SimpleXML to fetch and parse the image feeds from Flickr. In this article you will learn two main things: how to parse XML using SimpleXML and how to get Flickr images from RSS feed and display them on your web page. He offers both a demo of it in action and a download of the source for those that want to jump right in. The tutorial walks you through fetching the XML feed for a Flickr gallery, loading it into a SimpleXML object and creating a reusable class to pull out the photo titles, image details and profile link. On the Zend Developer Zone there's a new tutorial showing you how to integrate your application with Flickr with some help from components in the Zend Framework. Like many Web 2.0 applications, Flickr exposes its data to the public via a REST API, making it possible to develop customized applications that run on top of the base service. This REST API allows access to a number of important functions, including photo searching, tagging and uploading; photoset retrieval; contact retrieval; and panda recommendations. The tutorial uses the Zend_Rest_Client component of the Zend Framework to make the actual request to the Flickr API and you'll need a API key/shared secret to be able to use it. The rest of the tutorial is code dedicated to helping you connect to the service, fetch data, search the API (and output the results), and looking at some of the "interestingness" magic Flickr has to share. In a recent post to the Web Development Blog there's a tutorial about creating a simple script to connect to Flickr and run a search to return matching image thumbnail information. Our last tutorial about the flickr API was an example on how-to search the flickr photo database for images using some short PHP code. This time we will use parts from the past tutorial together with some jQuery Ajax requests to show our photo search result without reloading the web page. They include the code for the different parts of the application - the HTML for the frontend form, the Ajax functions to access the PHP backend interface and the PHP code to make the request over to the Flickr API for images matching your search term. On the Web Development Blog there's a recent post about connecting your PHP application with the Flickr API to search for photos with the help of a simple class. We will be using the php function "file_get_contents" to receive data from flickr. The data which we will receive will be a serialized PHP array which means all we need to do is unserialize the array and we will easily be able to use the data returned. As an alternative we can use a cURL function to get the data, for example if the function "file_get_contents" is not allowed on your web host. They show how to get your API key from the Flickr website and the sample code that you'll need to make a GET request (with file_get_contents) and an example of a loop displaying the response. On DZone.com today there's a new screencast posted from the NetBeans IDE group showing how to create a simple Flickr slide show inside the application. In this screencast, Justin Bolter, Technology Evangelist at Sun Microsystems, shows you how to build a PHP Flickr slideshow using NetBeans IDE 6.5 . Bolter walks through the various ways in which NetBeans IDE 6.5 supports PHP development, including project support, run configurations, code completion, syntax highlighting, documentation, refactoring and debugging. If you can't view the screencast, the full transcript of it is also included in the post. Keep an eye here for more summaries to be added to the list as they're posted. Sebastian Bergmann has posted a real world benchmark as justification for moving from a PHP 4 to PHP 5 environment - evidence from Flickr's change. Benchmarks such as the PHP / GCC / ICC Benchmark I posted quite a while ago on this blog are synthetic. They test "raw bytecode execution" speed that cannot be translated into real-world situations per se. Flickr recently migrated from PHP 4 to PHP 5. And here are their real world numbers. The graph shows a dramatic drop in processing needed (CPU usage) at the moment they made the switch over from PHP4 to PHP5.The system processing usage stayed about the same (system processes like logging and memory handling) but the user CPU usage (like what the web server would use) saw an immediate change by almost twenty percent. In this new tutorial from NETTUTS.com there's information on how to create a gallery of the images from your Flickr account with help from SimplePie, a PHP tool for parsing XML feeds (like RSS). Ok, so we're going to be touching on a number of technologies for this tutorial. We'll be using an RSS feed from Flickr, a bit of PHP, and some jQuery to make things nice and interactive! We'll use SimplePie to handle the RSS feed, as it makes life much easier, and can be used in any other projects where RSS feeds are involved. Bughuntday is a whole day developers can come together to start fixing bugs for open-source frameworks and libraries. This Saturday we started these series with Zend Framework, a hugely adopted PHP framework within enterprise and professional web application development. He also includes the slides from the presentation and a video of Jurien Stutterheim's talk introducing everyone to testing and the Zend Framework. There's pictures of the event on Flickr too. Check here for an updated video from the event.